Monday, November 25, 1912: Today, don’t remember. Sounds like a slow day for Grandma. 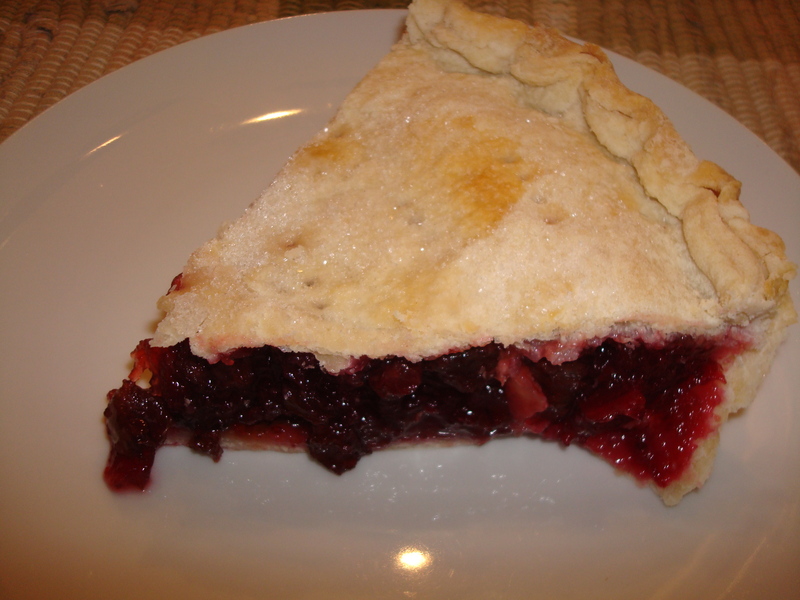 Since she didn’t write much I’ll share a hundred-old-recipe for Mock Cherry Pie that I made for Thanksgiving. The pie is made with cranberries and raisins. It’s enticingly tart–yet sweet–and a nice addition to my repertoire of Thanksgiving pies; but it tastes (surprise, surprise) more like a cranberry raisin pie than a cherry pie. Pick over and wash three cupfuls of cranberries, and cook in half a cupful of water until broken. Add one cupful of sugar and one cupful of raisins. Bake between crusts in 9-inch pan. Posted on November 25, 2012 August 30, 2015 by SherylPosted in Food, recipesTagged cranberry, pie, raisin. I am sure it is yummy, but I can’t imagine it seeming like cherries! Looks worth trying. Thanks. I wonder what would ‘cropped’ raisins be? Like chopped? looked yummy! It is a very pretty, festive pie. Sounds good… will need to make it. thank you. Enjoy your posts.